IN A TIME...LONG, LONG AGO, WATER COVERED THE EARTH; THERE WAS NO LAND. IT WAS A LONG TIME BEFORE MANKIND AND ALL OTHER LIVING THINGS EVOLVED FROM THE PRIMEVAL WATERS. WE NEED WATER TO SURVIVE. IT CAN TRICKLE AS A MOUNTAIN STREAM OR ROAR LIKE THE SOUNDS OF THE OCEAN'S TUMULTUOUS WAVES DURING A RAGING STORM. WE NEED WATER FOR ALL OF FERTILITY...THE LAND, THE CREATURES...AS WELL AS OURSELVES. 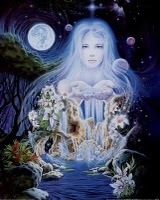 THE WATER GODDESS HAVE ALWAYS BEEN THE GUARDIANS OF THE SPRINGS, THE WELLS, AND THE RIVERS. THE GREAT MOTHER IS THE OCEAN. THE WATER GODDESS PROVIDES US WITH WISDOM IN TIMES OF STRESS AND GRIEF OR WHEN WE ARE MOST IN NEED OF COMFORT AND SUPPORT. SHE IS THERE WHEN WE FIND OURSELVES AT THE CROSSROADS, AND SHE CAN REMIND US TO FLOW IN THE RIGHT DIRECTION...TO MARK OUR LIFE STAGES WITH RITUALS. IF WE FEEL AS IF LIFE IS CLOSING IN, AND WE ARE DROWNING, SHE CAN REMIND US THAT THE WATER SUPPORTS US; WE DO NOT NEED TO GO UNDER. THE "APSARASES "(MOVING WATER) ARE HINDU CELESTIAL NYMPHS WHO CAME FORTH FROM THE WATERS; THEY GIVE SOLACE TO THE DEITIES AND SOULS OF THE DEAD WARRIORS. THEY ARE BEAUTIFUL WITH THE GIFTS OF GRACE AND AND YOUTH...AND PROFICIENT IN THE ART OF DANCING. THEY ARE THE ESSENCE OF WATER AND SYMBOLIZE THE CLOUDS OR THE MISTS...THE NURTURING QUALITIES OF WATER, AND AS WATER, THEY HAVE THE POWER TO CHANGE THEIR FORMS AND CAN CHANGE THEMSELVES INTO BIRDS OR FISH WHENEVER THEY SEE FIT. THEY GIVE US THE GIFTS OF ENERGY TRANSFORMATION AND NURTURE US. This entry was posted on 22 November 2011 at Tuesday, November 22, 2011 . You can follow any responses to this entry through the .